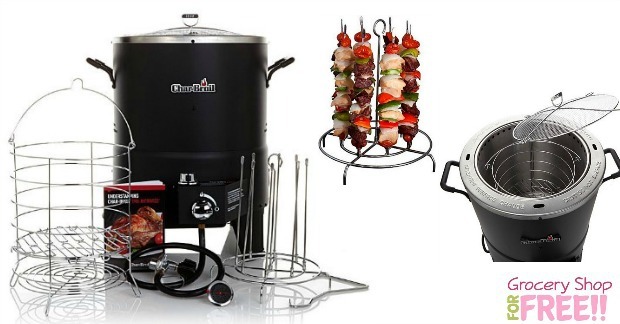 Infrared Oil-Less Turkey Fryer Bundle Just $74.99! Was $115 PLUS FREE Shipping! You are here: Home / Great Deals / Amazon Deals / Infrared Oil-Less Turkey Fryer Bundle Just $74.99! Was $115 PLUS FREE Shipping! Are you looking to fry your turkey this year? I have never tried it, but, I hear it’s very good! Right now, TODAY ONLY you can get this Char-Broil Big Easy TRU-Infrared Oil-Less Turkey Fryer Bundle with 2 Leg Racks and Kabob Set for just $74.99 down from $115.61 PLUS FREE shipping! No hot oil to burn, splatter, or spill! Save money and stress without having to purchase or dispose of any oil – and, of course, the food is healthier, too! Includes cooker, cooking basket, lifter, meat thermometer, and quick start cooking guide. (propane tank required for operation- not included). The Char-Broil Big Easy TRU-Infrared Oil-less Turkey Fryer is the stress-free way to fry your turkey. With no hot cooking oil to purchase, splatter, or dispose of, the Char-Broil Big Easy gives you a delicious, safe, and simple alternative to oil-fried turkey. The Big Easy uses infrared heat to cook a turkey from start to finish just as quickly as oil-frying – and, of course, food cooked without oil is healthier, too! The meat is always cooked evenly inside of a double-wall cylindrical cooking chamber, powered by a fully enclosed propane burner: Char-Broil’s patented Heat Wave infrared technology prevents flare-ups, eliminates hot and cold spots, and delivers juicy, crisp, and flavorful results every time. Safely cook a turkey (up to 16 lbs.) or chicken in about 8 to 10 minutes per pound – there’s no waiting for the oil to heat up. Roasts and most other large cuts of meat cook for slightly longer. You can prepare your bird or meat with the same injectable marinade you already use, or you can use seasoned rubs on the outside – which is not an option with traditional fryers. Experience the flavor when infrared heat circles the cooker to penetrate the meat evenly and seal in juices. The result is a bird that’s moist on the inside and crispy on the outside without the risk, hassle or added fat and calories of oil.